Hey there, friends! Today is a super fun day over at Simon Says Stamp! It's time for the STAMPember Blog Hop! There are SO many new goodies and I have some adorable new Christmas dies to share with you today. If you want to start at the beginning of the hop, head on over to the Simon Blog for a full list of stops. If you are already following along, you should have come here from Lucy's blog. She is one amazing lady and I can't wait to see what she has whipped up for us today! For this next card, I used 2 new dies. The Christmas Blessings die and the Deco Tree die. The little spirals on the tree are not glued down and I love the look! Like little springs. I also glued down the sentient in a few random places just to give it a little more of a 3D look. Simon Says is giving away an awesome prize pack to one random commenter on every blog in today's hop. How cool is that? The giveaway for the prize pack will close at 6:00pm EST on Thursday September 11, 2014 and the lucky winners will be announced on Friday, September 12th over on the Simon Says blog. Good luck! To see the whole Simon Says release together, click HERE. Thanks for stopping by! Your next stop on the hop is over to the very talented and sweet, Barb Engler's blog. wow Laurie.. these are so totally cute.. love that picture in the frame.. so adorable..
Beautiful holiday cards! I love the top one with the picture! Fabulous cards! Wonderful new dies! Great cards! What a neat way to send a photo card for the holidays! The picture card is so adorable ! Thank you for sharing your creations. Gorgeous cards---loving the photo card! Great idea! Super cute! I love the photo card....the snowflake dies are great! The Christmas Blessings die is a must have, very pretty. The little trees with the spirals popping up looks fantastic and the photo card.. just wonderful. Love the way you added dimension by gluing the stripes down to a panel and adding to the card front. These are beautiful Laurie. What a fun holiday card idea. Thos cards are amazing and your daughter looks exactly like you! So cute! I love the photo card you made!And your children are adorable! These cards are beautiful! I especially love the deco tree and the Christmas Blessings die cuts. Absolutely perfect way to sent pictures at the holidays. Just adorable. Fabulous Laurie! The polaroid frame already is on its way to me. Love the adorable picture of your little ones. And the second one...the detail on the dies is divine! I must say i really love your backgrounds. Great cards. Fabulous photo card and love that Christmas tree die! I like your Christmas photo card! What a great idea! I love what you did with the christmas polaroid die, think I must buy it. Your cards are gorgeous! Love that spiral Christmas tree. Great cards! I especially love the picture card. I love sending and receiving picture cards during Christmas. This is a great way to incorporate the handmade cards and pictures! Super sweet card using the fabulous Christmas frames! One of my favorite things from this release!! Lovely Christmas cards, it will be here before we know it! 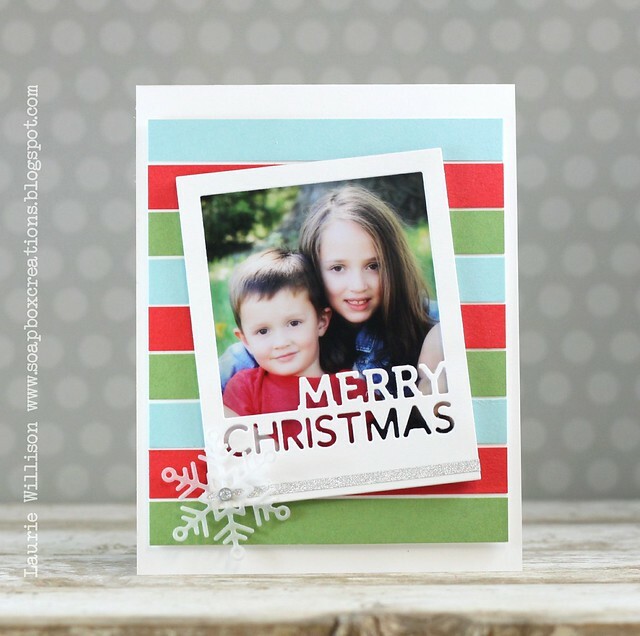 I love the idea of using the polaroid die cut for your Christmas card! Love how you used that frame for a real foto. Great idea with the bold colors too. Beautiful cards. The the tree! Gorgeous! I'm loving this release! I LOVE the sentiment die cut out of gold!! What great Christmas cards! I love them both! Thanks for sharing! I LOVE LOVE your creations! Love the dies and how you showcased them, especially the picture card! Such a wonderful idea to use a picture with the frame. love you cards! Really like the photo idea. Lovely cards. Love the photo card. Great use of the die. The tree card is whimsical and looks easy to assemble for mass production. Love the release and what you did with some of the new products. Thanks! How perfect is that frame? It is spot on for a picture Christmas card! Great idea. I totally like the new Christmas Frame Die. Cute Projects ! Love this new Polaroid die, like you said, so much versatility! Wonderful new die cuts and sentiments in this new release! I love the personal touch you've added to these cards :) and the traditional Christmassy colours you've used! Great cards and love the photo frame. Very cute cards. The die cut tree is one of my favorites from this release. And how fun is that christmas picture card. Who wouldn't love to get that instead of one of the mass produced flat picture cards at Christmas time. Love the cards and was hoping a designer used the frame die....adorable! Thank you for sharing. Your Christmas blessings card is just gorgeous! I will be tryng that out when my box arrives! Love the Polaroid frame on a card so cute! Beautifully crafted cards, sweet photo frame!!! Love these cards. So sweet. Wonderful idea for photo cards! Love that Polaroid die! Love the polaroid cared! Hope it will fit in my PL pocket! OK, you've clenched it for me, gotta have the Christmas Blessings die. Your cards are both fantastic. Sweet cards Laurie. Love the journaling tag with the striped background. The swirly tree is so elegant. Stamptember my favorite time of year. Thank you. Love, love, love your holiday photo card! Never would have thought to use it that way. May have to borrow your idea and put something similar together for my cards this year. Love your Christmas cards! Makes me excited about Christmas already! Your photo card is adorable; what a great way to send Christmas greetings. I love the tree card, too. So many wonderful new products!! Thanks for your inspiration!! Very beautiful! Great cards to send to the whole family! absolutely adorable! Thanks for the ideas! Beautiful cards. Thanks for the ideas. Gorgeous cards to show off the gorgeous new dies Laurie! I'm so casing the picture idea…that is just brilliant! Stunning!!! Love the new tree die! Very beautiful card! The Deco Tree die is supercute! Beautiful cards! Thank you for sharing them! I am not ready to think about Christmas yet but your cards really caught my eye! Well done! Love the idea with the picture in the frame. Thanks for the great Christmas card inspiration! I'm always looking for cards to create for the holidays that I can mass produce. I think your samples fit the bill. These new die cut products are great! Your projects are beautiful! Love the new release. Your cards are just great as always. I am such a fan of all your work. Love the picture card! 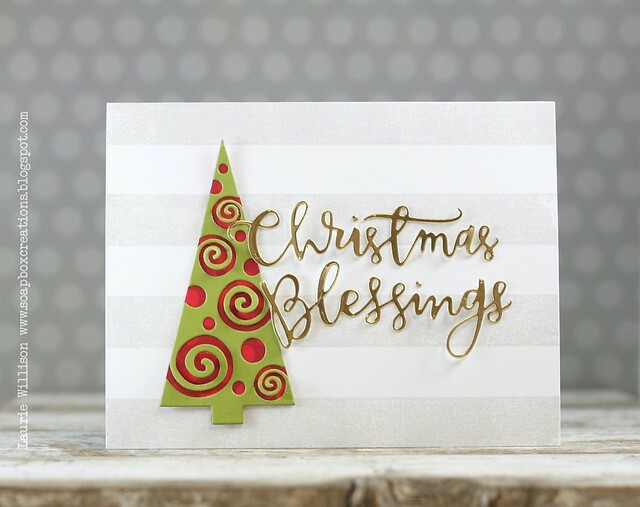 The Christmas Blessing die cut is the perfect touch on your second card. Thanks for the chance to win. Love the card with the frame and picture. Thanks for the inspiration. Laurie!!!! I'm heading over to Facebook, where I plan on sharing your photo Christmas card - I'd love to make these for my kids who send out photo cards each year! So, that gold paper? Gorgeous!! I love that you included a picture on the front of your card! That's a great idea! I'm really liking the scripted greeting dies that SSS is releasing this time. Thanks for sharing. Cute cards love the frame with the picture. WOW! 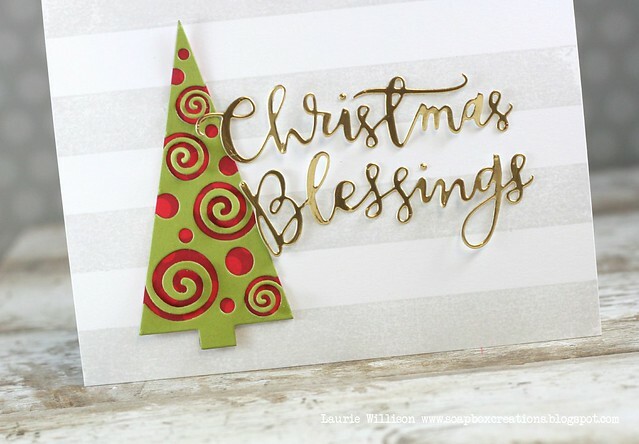 I love your Christmas Blessings card - it's classic and yet the font of your die cut and the die cut tree bring a fun feeling to the card. Really nice! beautiful cards1 love the Christmas frame! Love the colours and how you've used the dies. beautiful cards... love your clean crisp designs! What a great idea to include a photo. I love it! Lovely cards for Christmas. Need to start on one :-D.
I love the fact that these cards could be made and look better than the boxed cards that are normally sent over the holidays! The photo card is brilliant! 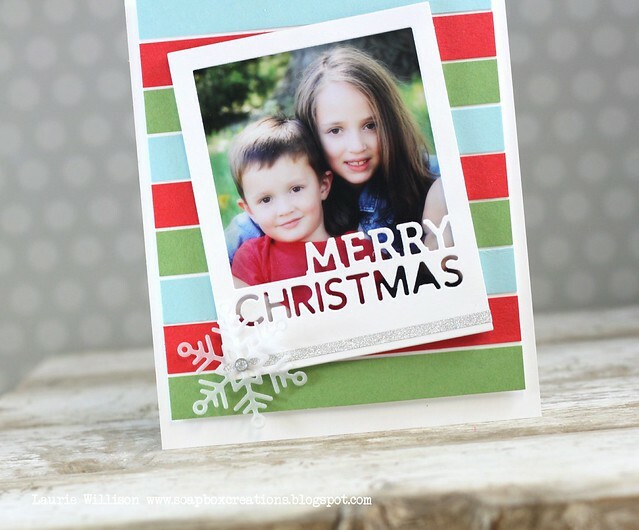 Add a photo to the card is a nice idea for personalize christmas cards! i like it! Love that swirly tree! Great cards! I love that you were able to personalize the first card with a photo. I might need to consider that for our cards this year! I can never decide between handmade or photo cards, so it's the best of both worlds! I think personalized Christmas cards are wonderful - your family will love it! Love the simplicity of the Deco Tree card. It allows the tree & sentiment to take centre stage! I love the photo card! This is a great way to send one!!! The script dies are to die for...pun intended! TFS your amazing projects!! Love your cards... the gold is just stunning! Also love that your put a simple touch to the photo card, but it made such a difference! TFS! Lovely cards. The photo card idea is a real winner! Love the holiday frames die! And I love the funky Christmas tree! Adorable picture of your kids. Great cards and new products! Great use of the die as a photo frame. And I love the spirals pulled up on the tree. Great cards! So lovely photo of your kids! Love the photo card with those colourful stripes. Wow..... two amazing cards! LOVe how you've used the Holiday Frames die! Love your cards.. The deco tree looks so amazing.. Great photo card..
Gorgeous cards! I love the photo card. Such a wonderful change from the standard postcard type. And for the second card, I like the idea of not tacking down the entire sentiment. Love! Thank you for sharing! Fantastic cards!! I love your photo frame card with picture! And that Christmas tree die is awesome! Beautiful gold foil sentiment on your card!! great photo frame, easy to mass produce too - thanks. I love both your cards! The first one is personalized and it is perfect for sending to family and the second one is so delicate! Thank you for the inspiration! I love the first card! I am making ones like that next year for X-Mas!!! I love the way you achieved the 3D look and your use of the space. My favorite in the new release is the Presents & Ornaments stamp set. The Christmas tree die is very unusual and makes just a great image. Love the card! Very sweet photo Christmas card and I like the gold sentiment and the loose spirals on the tree. Love the Polaroid look. Love the new dies! Thanks for sharing. What great ideas for Christmas cards!! Love the die with the photo! Very inspirational cards!! Both cards are very beautiful...first card is precious and the second card is very pretty..love how you popped the tree with color! I love this tree, must have it! Lobe the idea of putting a photo in the card! Love the Christmas card. Thanks for sharing. Both of your cards are gorgeous! So much fun dimension and love and how you personalized the first card using a photo! I loved the christmas photo card such a nice way to mass produce them and still look unique. simple but so elegant. I especially like the card with the picture. Thanks for sharing your talents with us. Adorable cards. Love the trees! This is a perfect frame for a pretty photo. Also loved your Christmas card. First card reminds me of the old polaroid instant photos. Love this idea! I love the sentiment "Christmas Blessings". Love these new dies. Thanks for sharing. Both awesome CAS cards!! Love the striped background on that second card!! Fabulous cards!! This release from SSS makes me giddy and your examples add to that! Thanks for sharing. Great job! Love the merry christmas die! Those cards are so cute. Love the colors! I love these cards, what a nice way to share family photos with the people we love. Thanks for sharing today. Love the cards, hank for sharing them with us. Laurie,these are both so beautiful! I love how you've used the frame on the first one ( cute picture ),and the gold word dies on the second one! Oh WOW! love both cards, but especially the first. I like how you not only popped up the background, but also the picture. The Polaroid card is really sweet! Thank you for sharing. Super cute cards - love the spiral tree.